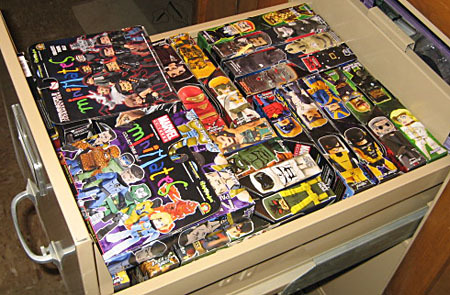 Remember four years ago when we started these Minimate Mini-Reviews, and showed you this picture? That solitary box set is the subject of today's review. Under a cloud of increasing anti-mutant sentiment, Professor Xavier created a safe haven at his Westchester mansion where he could train young mutants to use their powers for the betterment of mankind. Xavier spent months recruiting his early students (code-named Cyclops, Iceman, Angel, and Marvel Girl), dubbing them "X-Men" because each possessed an "extra" ability normal humans lacked. Reserved in demeanor, Scott Summers hid his emotions from others, just as his ruby quartz visor hid his destructive eye beams from the world. Unable to express his love for his teammate Jean Grey, he was nevertheless a skilled tactician, and was made deputy leader of the X-Men. This X-Men: First Class should not be confused with the movie X-Men: First Class: though they share a name, the relationship is as tenuous as the one between the two media each separately named Age of Ultron. 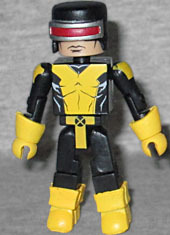 Cyclops, unsurprisingly, uses an existing mask and boots, though this time his glove flares are separate from the hands. Jean Grey was 10 years old when her mutant telepathic powers first manifested, allowing her to experience the emotions of a dying friend. Taken to Charles Xavier for treatment, she helped the professor fine-tune his Cerebro machine, allowing him to locate and assemble a team of mutants, with Jean at its heart. The premise of X-Men: First Class was that it took place between the existing issues of the '60s comic, and that the uniforms the team wore were backups for when their normal suits were damaged or dirty. These were black and yellow, rather than the traditional blue and yellow - yes, blue. Let people argue all they want, but Kirby drew those original uniforms as blue with shadows, not black with highlights. 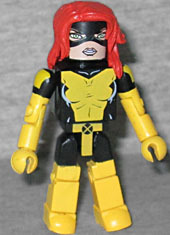 Jean's version of the uniform has long boots and gloves, which call to mind the ones she'd later wear as Phoenix. Her hair new with this set, but it's so detailed that it keeps her head from turning. Or moving at all, honestly. Born into a wealthy family, young Warren Worthington's life changed forever the day he sprouted wings. While he hid them under his clothes at first, he soon realized the could help save lives, and he rescued his classmate form a fire while disguised as an angel. 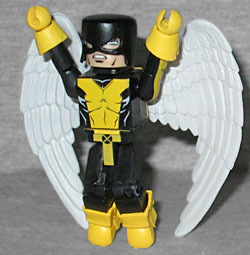 He was quickly recruited by Professor X.
Angel is mostly a retread figure, with the usual mask and wings, and the same gloves and boots as Cyclops. The First Class uniforms do away with the trunks, in favor of a full-torso stripe like Jim Lee gave the X-Men. They have no belts, though the standard Minimate construction suggests one anyway. 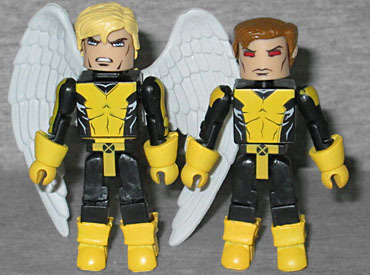 There are details painted on the torso, and Angel customizes his uniform with stripes on the arms. He and Cyclops both have hair, for those times you don't want a mask. Bobby Drake did not have an easy time coming out as a mutant. Pursued by a lynch mob, he was only spared by the intervention of Professor X, who stopped the mob and erased their memories of Bobby's ice-generating powers. At first, he coated himself with a layer of snow, but he later protected himself with solid ice. Bobby, of course, doesn't get to show off his new uniform. His body is a semi-translucent plastic, to make him look icy, and it's detailed with black and pale blue lines on his chest and face (though at that point, he was still just covering himself with ice, not fully turning into it). The addition of hair, rather than a bald head, makes him look youthful. Like many Icemen before him, he comes with a big ice blast that can fit onto his arm. 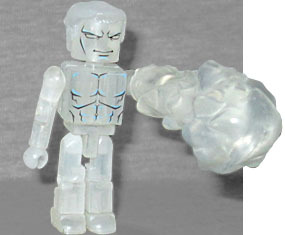 Oddly, the packaging parses his name as "Ice Man" instead of "Iceman." This is a decent box set and, other than a TRU-exclusive Marvel Universe Comic Pack, comprises the only First Class toys anyone ever released. The worst thing is, since the Minimate box sets are always four-packs, Beast got left out of the lineup, and Art Asylum never found an appropriate place to include him. 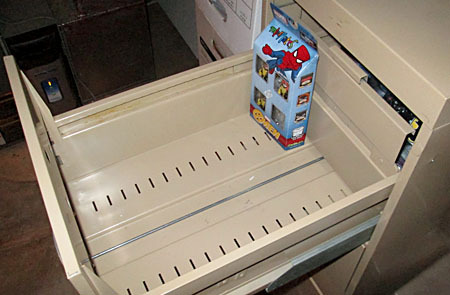 So are you still picking Minimates up, Yo? Or has there just not been much you were keen on lately? I must admit, I've always wondered how you guys afford/display/store everything, just with the sheer quantity of stuff that gets reviewed over the years. Let me know what you need, I'll see what I can get you.